If you’re so inclined, pull your car over shut your cellular device off and take a walk along a ditch bank. You will see red wing blackbirds selecting the best place for a nest in the cat tails. You will also see meadow larks sitting on the fence posts that border freshly tilled potato fields. Look up and you will see a red tailed hawk soaring. Look down on a ditch bank and you will find asparagus sprouting. Head down to the river and depending on where you are at, caddis will be out in abundance! March Browns and Blue Wing Olives will be plentiful. The best part of all this is that trout are eating flies on the surface! We are so blessed and fortunate to live here. If you live here and can take advantage of this then I would highly suggest you do. If you don’t live here and can swing a long weekend do it! The Henrys Fork in Island Park has come down to 649 cfs. As of today I have not seen much in the way of good solid dry action but I am sure it just around the corner. I have been rolling some rocks near the bank and have found good numbers of March Brown Nymphs as well as caddis. 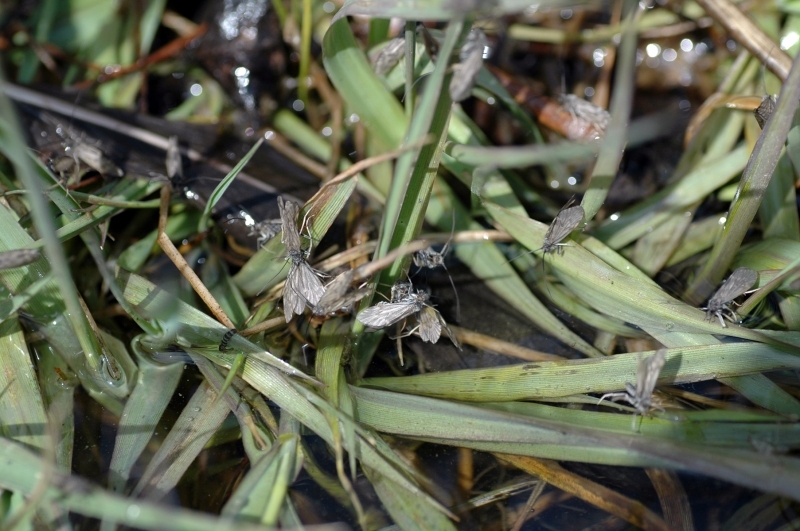 Also plenty of Green Drake Nymphs. There are also plenty of midges around. The Box Canyon has been a little tough over this past week due to the fluctuation in water released from the reservoir. If flows hold then a trip down the Box may be worth your time. Streamers and rubberlegs will be on the menu! Black #8 rubberlegs with a red or pink San Juan Worm will turn some heads. Double Dirty Hippies in the rainbow color will also do the trick for a streamer. Warm River to Ashton and on down is where I would focus my efforts. The water is a bit off color but do not let that slow you down! The caddis have been prolific for the last two weeks and the fish are on them! Take a drive up to stone bride one evening and see for yourself. A #14 tan or olive Lawson’s EZ Caddis will keep you busy. Don’t forget your Lawson’s #14 Caddis Emerger. When you find yourself in that situation when the” fish are just a boilin” and you can’t get them to eat a dry then swing the caddis emerger through them. From Ora Bridge on down the action really heats up. I had the pleasure of fishing with my good friend and outdoor writer Kris Millgate and her husband Jim on Thursday and we launched at Ora. The fishing was a little slow to begin the day but around 1:00 the caddis began to emerge. We fished dries with a little action but pretty slow until we hit Vernon access. Right at Vernon the March Browns made and entrance. The dry fly action heated up! A #10 Parachute Adams was all we needed. Kris did a great job of putting a fly in front of theses trout and the trout did their part. It’s been fun for me to watch Kris over the years. When I first met her she didn’t know what end of the fly rod to hang onto. Watching her on Thursday string her own rod tie on her own fly, spot the fish she wanted to catch then making a great cast followed by a few mends and then catch the trout she was after was a real pleasure. The high light was watching a big rainbow eat her fly and make a charge for the middle of the river and then watch as her lanyard got caught up in her reel and of course that was the end! Big Henry’s Fork Rainbow 1, Kris Millgate 0. To her credit she made up for it with a few fish to the net. The South Fork is on the rise and very dirty. Current Flows are 10,200 and are still on the rise. I would steer clear of the South Fork until flows have stabilized. Palisades is currently at about 80% of capacity with Jackson Lake close behind. With the amount of snow that is still in the high mountains I would guess that Palisades Reservoir will fill and the South Fork should be great this summer. The Teton looks like it coming back down to fishable levels. Keep a close eye on the flow charts when planning a trip to the Teton this time of the year. Looking at the flow chart now it resembles an electrocardiogram scale after a few tremors! If flows come down to 500 cfs and below and will stabilize then grab a handful of #16 tan EZ Caddis and get to the river! 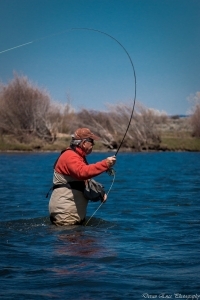 Right now the Lower Teton is clear enough to get fish on streamers and nymphs but that might change as temperatures warm back up. 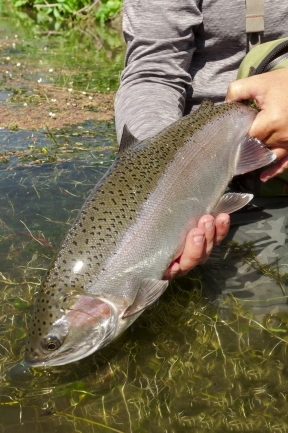 The Madison has been fishing well throughout the spring. While the water levels have fluctuated a bit and the water has been dirty the fishing has remained strong. A #8 or #10 brown rubber legs will keep you in the zone. I would also have #16 brown and green Zebra Midges and some #16 Beadhead Prince Nymphs. The streamer bite is also really turning on! 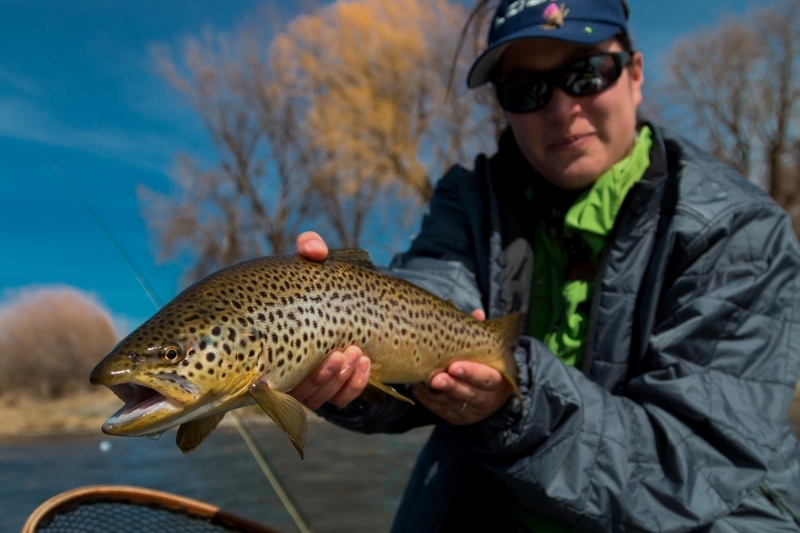 Mikes Woolhead Sculpin and Blings have been getting the attention of the brown trout that call the Madison home. We have gotten the majority of our new inventory in the shop for the summer. We have great deals on the old inventory so swing by the shop before summer gets here and take advantage of some great deals! Up to 50% off on some items. We have also been running a few guide trips throughout April. Needless to say I have seen some smiling faces in the shop! This is a great time of the year to be on the river! We have plenty of guides that are ready to get on the water so give us a call and we will do the rowing for you! We sincerely appreciate the fine photos by Devan Ence (Kast Gear) for his beautiful photos for this report.